The Need for Speed... And EcchiCredits. This year has barely begun and already we're working hard to improve the service for everyone here at EcchiDreams. Firstly we all hope you had a wonderful Christmas (Or holidays) and a Happy New Year. This update was focused mainly in the back end, which would affect the stuff you see, although there isn't that many feature changes... That's coming in the Spring Update. I also want to address the new influx of Dreamers that have found themselves making an online home here at EcchiDreams; Welcome to EcchiDreams! Thanks to you all, and some of our veteran members alike; we achieved 50 online Dreamers in the space of 24 hours; and for a small site like ours with next to no advertising budget, this is a big deal. We hope EcchiDreams continues to grow, and that you stick around. EcchiDreams has come a long way, and we hope that it continues attracting like minded roleplayers who want to RP and have fun. As part of our effort to increase the site's snappiness (speed) and decreasing response times (time you wait for a page to load, or even change when you click on something) we've made, what we feel to be a major breakthrough. This is why we wanted to go offline for 2 days, to get this done and to cover any possibility of the server completely crapping out. Not only did the server not "crap out", even once, but the updates went uncharacteristically and disconcertingly smoothly! I might be biased, but I've noticed an immediate speed improvement already. Take for example the Emoticons (Emoji) when making a post; when you click on that smiley face in the text editor, it used to take 10-20 seconds for it to load when hardly anyone else was on the site, 30 seconds to a minute on a busy day. This was untenable, and no doubt others had noticed this too. But since the update, it took between 4 to 6 seconds. It's not perfect - yet, but that's a massive improvement. Pages seem to load much faster, although we have no official metrics yet (because the sites we use to monitor those things can't see our site whilst it's offline), so when the site is online again I will be posting some information down in the comments, comparing the before and after. We very much hope that this makes everyone happy, including Dreamers who use mobiles, which has been especially noticeable on. I won't get too technical about it, but this should help with the influx of new Dreamers we've been having, so please let me know what you think - does the site feel faster to you? Do pages seem to load quicker, does it respond better? Before the Big Update on EcchiDreams, we had a feature called EcchiCredits and EcchiCash. EcchiCredits was the currency you earnt by contributing on the site (making posts, etc), and EcchiCash was where you could spend your EcchiCredits to change your display name (your username), your title, get premium membership, and items for your profile (like 'Dolls', or 'Cookies'). However, after the Big Update we pretty much lost most of this, due to the fact that the applications we used were no longer being updated by their third-party developers. And for a long time (nearly three years), EcchiCredits has been stuck in limbo, not useful for anything and barely collectable. Crippled, essentially. All Dreamers start out with ¢1,500 as a welcome to EcchiDreams gift. You get EcchiCredits just for logging in; you get an amount daily. At the moment it is ¢20 a day. Which if you're on every day, that's ¢7,300 a year - just by visiting once a day. In addition to this you also get ¢20 every week as long as you log in at least once; adding ¢1,040. In addition to this you also get ¢100 every month, as long as you login at least once; adding ¢1,200. So in total, if you're on every day you can earn ¢9,540 a year, by pretty much doing bugger all other than logging in. You can get EcchiCredits (10% a Year) by storing your monies in your bank account. You get EcchiCredits for reporting bugs! Depending on Severity (decided by the technician responding to the ticket) - please note the last three are so rare, there has only been one report of a major security-flaw caught by a Dreamer, and that was before my Administration (and I've been here 5/6 years). And so on... Making EcchiCredits is really not that hard; check out these fine Dreamers who've earnt a fair amount. Can you overtake them? As for the EcchiCash Shop - we've brought a basic version of it back with a different name; The EcchiStore. It doesn't have much in it right now: as I said, it was going to be a starting point that I hoped we could actually work on and expand over the year or so. The staff are already going through some ideas of what to include with the store when we can, so we're open to taking suggestions and such. We decided against most of the items that come with the shop, such as "Steal another Dreamers Reputation", because that's likely to start arguments that frankly none of us want. There were other things that were a problem too, such as "Reset Warning Points", which is understandable from a "Paying a Fine" point of view, but at this time none of our 'Non-Bannable' warning points are permanent; they self expire after time anyway. But we would have liked to have done some kind of profile items, stuff that is just stuff and has no meaning or effects other than it's just stuff. Just quickly here... The EcchiChat system has been updated: it's had a number of bug fixes and layout tweaks, yet it still somewhat looks the same. It should also be slightly better in terms of performance. And that's pretty much it. Please leave a comment below as I will read them. I don't believe this was done by any artist in particular, but by the company itself as CG. I wanted a character of some description sitting on a pile of Gold, to celebrate the EcchiCredits coming back as well as the EcchiStore and my Image-Board Lurks didn't fail to please. 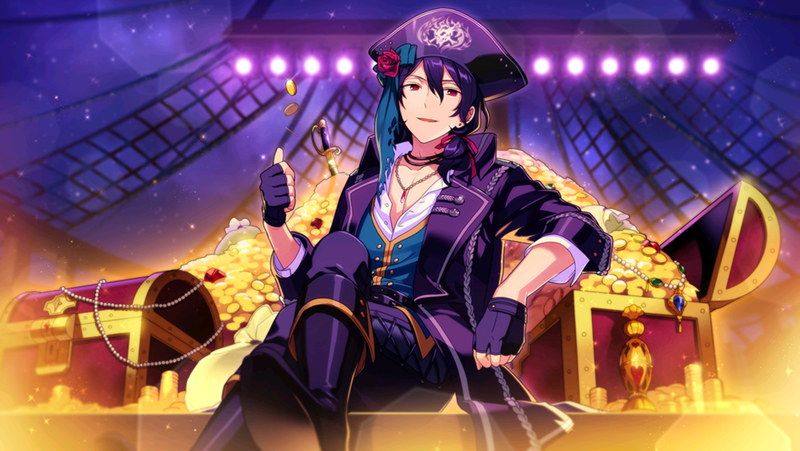 Apparently this image is from Ensemble Stars; which I believe is a mobile trading card game (That you can download from Google Play / Apple App Store) and has had a novel and manga made for it and has an Anime show in production for it. I'm not paid to sell it, so if you like the sounds of it, by all means check it out, if not, don't. It's your choice. Fast speed indeed; regarding the loading times for Emojis to display, things load about three times faster than they did before (I counted 6 seconds when I loaded them just now). Very glad to see EcchiCredits making a comeback too! I'll have to check that out shortly. Thanks to @Temaelrin and @Neptune for working so hard on this site for us! Ooh I was wondering what the credits were for, cool.